A step by step discussion regarding using the plugin can be found here. Please refer to the official Adobe knowledge base article for detail regarding which configuration files can be found at each of these locations. The plugin also adds the ability to schedule a Lightroom catalog backup for next shutdown (LR4 only) and compress existing Lightroom catalog backups. Use Lightroom&apos;s Edit -> Catalog Settings menu item to specify how often you will be prompted to backup your catalog. Scheduling a Lightroom catalog backup for next shutdown is performed using the Offer To Backup Catalog At Next Shutdown menu item (LR4 only) in your File -> Plug-In Extras menu. This causes Lightroom to offer to backup the current catalog the next time you exit Lighroom. Manual backups and backup compression are initiated using the Run Manual Backup menu item in your File -> Plug-In Extras menu. The resulting date/time stamped zip file(s) will be created in the directory you nominate. 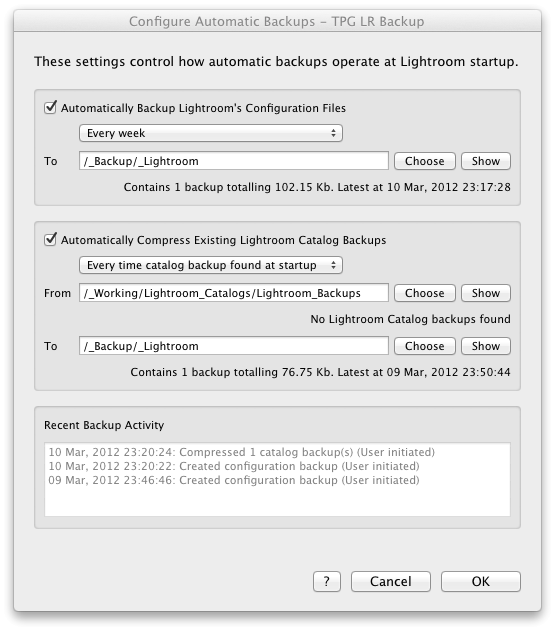 Automatic backups and backup compression can occur in the background when Lightroom starts. Use the Configure Automatic Backups menu item in your File -> Plug-In Extras menu to control the functions performed and their frequency. Progress of any activity performed in the background is displayed in Lightroom&apos;s top panel, next to the Identity Plate. A log of recent backup activity can be viewed at anytime in either of the Plug-In Extras menu items provided by the plugin. The Offer To Backup Lightroom Catalog At Next Shutdown menu item (LR4 only) causes Lightroom to offer to backup the current catalog the next time you exit Lighroom. If the Lightroom catalog has a regular backup schedule its counter will be restarted as if this was the regularly scheduled backup. 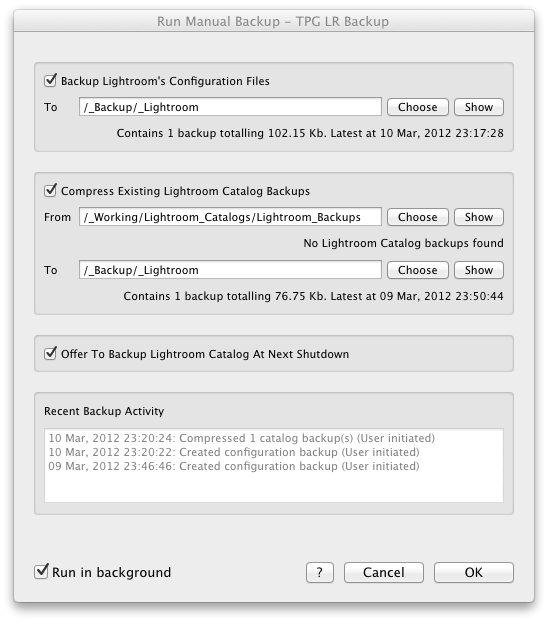 If this Lightroom catalog has no regular backup the offer will occur at the next Lightroom shutdown only. Please note that the catalog will only be backed up if you select the Back Up button from Lightroom&apos;s standard backup dialog when it is presented at shutdown. The Do Not Show option allows the user to choose whether they wish to see this dialog in future. The Backup Lightroom&apos;s Configuration Files section causes a zip file to be created containing the Lightroom configuration files identified above. The date/time stamped zip file will be created in the nominated directory. The Compress Existing Lightroom Catalog Backups option causes all of the Lightroom created backups in the nominated directory to be compressed. Use Lightroom&apos;s Edit -> Catalog Settings menu item to specify how often you will be prompted to backup your catalog. Additionally the Offer to Backup Ligthroom Catalog At Next Shutdown (LR4 only) option can be used to schedule ad hoc catalog backups when required. All backups can be quite large and often compress to about 10% of their original size. The date/time stamped zip files will be created in the directory nominated as the Compressed Directory. The Offer To Backup Lightroom Catalog At Next Shutdown option (LR4 only) causes Lightroom to offer to backup the current catalog the next time you exit Lighroom. This option operates identically to the menu item described previously. Recent Backup Activity displays a log of the most recent automatic or manual backups performed by the plugin. The Run in background checkbox controls whether the backup progress is displayed in the foreground, or whether you can continue to work in Lightroom while the backup is performed in the background. Progress of any activity performed in the background is displayed in Lightroom&apos;s top panel, next to the Identity Plate. Use the OK and Cancel buttons to initiate or abort the backup and/or compression tasks. The Automatically Backup Lightroom&apos;s Configuration Files section controls whether a zip file will be created containing the Lightroom configuration files identified above. The date/time stamped zip file will be created in the nominated directory, at the requested timeframe, as Lightroom starts. The Automatically Compress Existing Lightroom Catalog Backups option causes all of the Lightroom created backups in the From directory to be compressed. Use Lightroom&apos;s Edit -> Catalog Settings menu item to specify how often you will be prompted to backup your catalog. Additionally the Offer to Backup Ligthroom Catalog At Next Shutdown menu item (LR4 only) can be used to schedule ad hoc catalog backups when required. All catalog backups can be quite large and often compress to about 10% of their original size. The date/time stamped zip files will be created in the To directory, at the requested timeframe, as Lightroom starts. Recent Backup Activity displays a log of the most recent automatic or manual backups performed by the plugin. Progress of the backup as it occurs is displayed in Lightroom&apos;s top panel, next to the Identity Plate. Use the OK and Cancel buttons to save or cancel the changes to the Automatic Backup configuration. Automatic backups and backup compression are performed as Lightroom starts. The regularity of these are controlled using the settings mentioned previously. Please note that the very first time Automatic Backups are enabled the backups and/or backup compression will be performed the next time Lightroom is started, regardless of the configured regularity. This is to confirm the settings have been correctly enabled and the regularity configuration settings will be honoured for all future runs.